Do we really need the Chartered College of Teaching? My edu-Twitter feed is currently a hive of posts about the forthcoming elections to the Chartered College of Teaching, which was set up to be a teacher-led organisation but now looks like it will be anything but teacher-led. 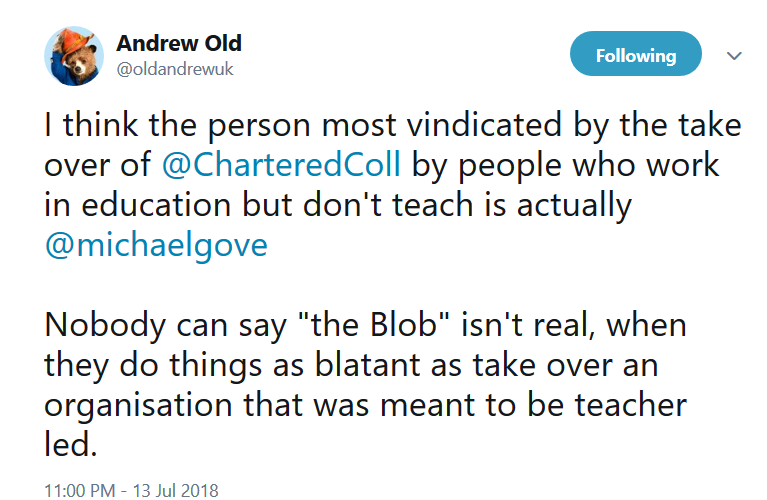 The discussion has been spearheaded by Andrew Old’s recent blog (entitled “I was wrong about the Chartered College Of Teaching. It’s worse than I thought it would be”), as well as this blog from Greg Ashman and this thread from Michael Fordham. I don’t particularly want to use this blog to add much to the discussion on the Chartered College of Teaching and how it’s run. My main focus in writing this is to investigate the question: do we really need it? I still struggle to get my head around why our cash-strapped government needs to spend millions of pounds on a new organisation for teachers. I’m told it is to develop the professionalism of teachers, by providing them with access to research and high quality CPD, as well as the all important certification of becoming a ‘Chartered Teacher’. This will, it is argued, provide a career path for teachers to rise within their profession. Now, if you’ve been on this earth as long as I have, perhaps you too might be a little sceptical about certification as a way of guaranteeing quality. Just because someone holds an impressive looking certificate, and adds a few more letters after their name, doesn’t really mean that this person is any better at their job than someone without such accoutrements. Similarly, we all know that just because a school has been rated ‘Outstanding’ by Ofsted doesn’t really mean that the school is actually outstanding. These are often arbitrary judgements, made by people who are as prone to bias as anyone else. More often than not, such accolades are simply proof that said school or said professional has jumped through the requisite hoops, said and done the right kind of things to appear to be outstanding. If the primary aim of the Chartered College of Teaching is to provide teachers with research and CPD, then here too I would question the need for this to be done via a well funded organisation. Opportunities for high quality CPD are plentiful without having to pay the rather steep price of membership. 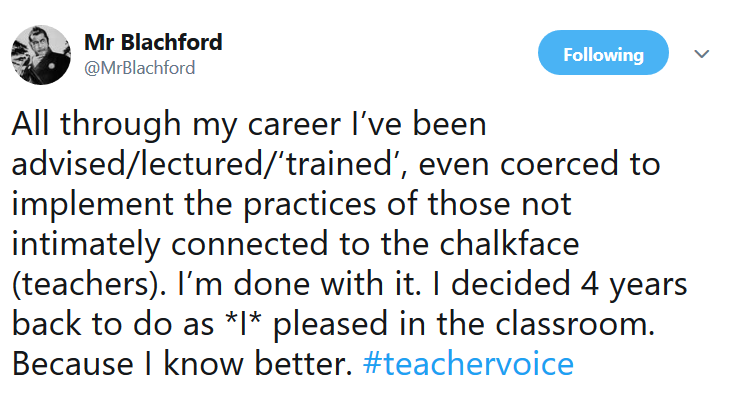 Just going on edu-Twitter, connecting with other teachers and reading blogs or articles they share, is a free and easy way to improve your practice. There are also many grassroot teacher conferences out there, such as ResearchEd, NorthernRocks, and BrewEd – to name just a few – providing teachers with a forum to share best practice. Some Multi-Academy Trusts also provide competitively priced CPD sessions in which they share good practice with other teachers and school leaders (I’m thinking here of Inspiration Trust, which has run some very interesting courses recently). So there’s plenty out there for the reflective teachers wanting to improve what they do. and, most critically, good leaders in their school, that set the right culture for the teachers to improve.